(Central Islip, N.Y., April 3, 2018) – The Long Island Ducks today announced the signing of right-handed pitcher John Brownell. He will begin his seventh season with the Ducks and first as a player/coach, as he assumes the role of pitching coach for 2018. Brownell enters the season as the Ducks all-time leader in wins (56), strikeouts (667), innings pitched (875.2) and games started (133). In six seasons with Long Island, he has amassed a record of 56-40 with a 3.59 ERA, 23 complete games and five shutouts. The 34-year-old also holds franchise single-season records in strikeouts (147; 2016), innings (202.0; 2014), starts (29; 2014) and complete games (7; 2013). 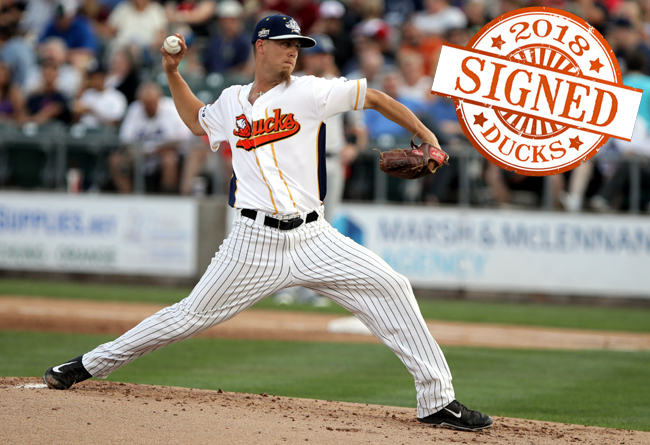 The Omaha resident led the Ducks to back-to-back Atlantic League championships in 2012 and 2013, earning Championship Series MVP honors in the latter after winning a pair of starts over the Somerset Patriots. The 12-year pro has started 11 postseason games with the Flock, compiling a 5-3 record with a 3.68 ERA and 44 strikeouts over 71 innings of work. In 2015, he became the second player in team history to be named Atlantic League Pitcher of the Year (Mike Loree; 2011) after leading the league in wins (12), innings pitched (175.2), complete games (4), shutouts (2) and strikeouts (146). The University of Oklahoma alum garnered his first Atlantic League All-Star Game selection in 2017. He posted a 10-5 record during the regular season with a 3.44 ERA, one complete game and 96 strikeouts over 24 starts. The righty’s ERA was third-best among Atlantic League qualifiers, while his 10 victories ranked fifth in the league. He also made two postseason starts, as the Ducks defeated Somerset to earn their second consecutive Liberty Division championship. With the addition of Brownell as pitching coach, the Ducks have finalized their coaching staff for the 2018 season. He will serve under the direction of Kevin Baez, who enters his eighth season as the team’s field manager. Also joining Baez and Brownell are outfielder/hitting coach Lew Ford, who begins his ninth season with the Ducks and fifth as a player/coach, and baseball legend Bud Harrelson, who has served on the coaching staff since the franchise’s inception in 2000.